In a couple of hours it will be a new month and what better time to commit to reading your Bible daily? No matter what season of life you are in you should be able to read at least one Bible verse a day. The easiest way to build the habit of reading your Bible daily is to start small. Reading one verse per day is a great way to get in the word daily but in a way that won’t seem overwhelming. 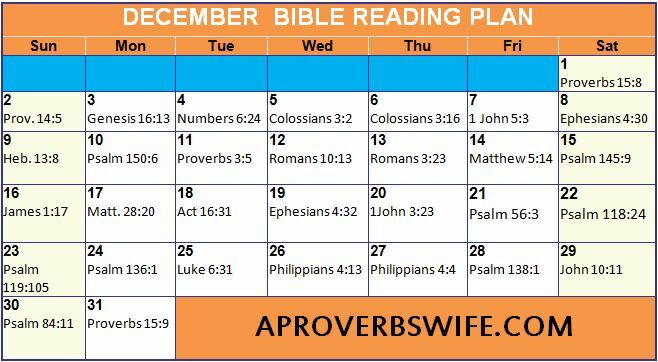 To make it even easier, I created this printable December Bible Reading plan. You can click on the image above and re-size to fit a sheet of paper, or you can download it here. If you enjoyed this why not PIN it! Great idea for a printable!!! Thanks. I love finding the verses and making them each month. So glad this was helpful. This was a nice resource! Thanks for sharing it with us. You’re welcome. That’s what friends are for!! Just in time to! Thanks!